With Mitsubishi Motors now part of the Nissan-Renault Alliance, a new seven-seat crossover marketed under both the Nissan and Mitsubishi badge could be the first collaborative effort between the Japanese automakers, according to a report by the Bangkok Post. 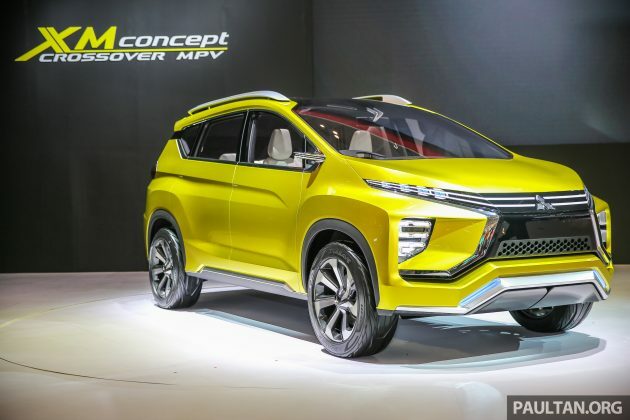 In the report, a high-ranking source at Nissan revealed that the model, which takes aim at the Honda BR-V, will be a rehash of a new Mitsubishi crossover previewed as the XM Concept. If you can recall, the concept was first shown at this year’s Gaikindo Indonesia International Auto Show (GIIAS) as a three-row, seven-seat people carrier. Mitsubishi’s crossover will most likely be introduced to Asean markets first ahead of Nissan, as Autonetmagz reports that production of the new model will begin in 2017 at Mitsubishi’s new Bekasi, West Java plant in Indonesia. Spyshots of a camouflaged prototype also reveal that the series production version won’t detract too far from the XM Concept. Following this, Nissan will likely assimilate the model into its own line-up for sale in other markets, although it remains to be seen if it will merely be a straight rebadge or something more comprehensive (new X-Gear, maybe?). In any case, Nissan’s collaboration with Mitsubishi will also extend to other vehicles, with the joint development of the next-generation Mitsubishi Triton and Nissan Navara pick-ups. Other areas of cooperation include electric vehicles, where the joint development and purchasing of components can help to reduce costs. Currently, Mitsubishi offers its i-MiEV, while Nissan has its Leaf, both being battery electric vehicles. Nissan usually quite generous in term of space except for Grand Livina. good for us consumers to choose. Mitsu… that is one very abnormal looking car. So Judge Dread.. This 7-seater Mitsubishi definitely looks better than the BR-V. Bring this on & we M’sian will have more choice & competition will bring better qualities & prices.